ShowGrounds offers a range of features to make setting up your events fast and efficient. From show templates, to integrated USEF and EC section database, to prize money templates, our system is designed to get your event set up accurately and quickly. Show templates allow you to completely configure a template that can be used to “build” future shows. 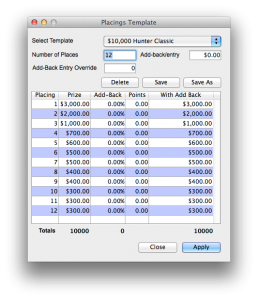 Prize money templates allow you to create unlimited templates for placings and prize money. These templates can be applied to one or many classes (as long as results are not entered) to instantly set placing, points, and prize money. Class rules provide a powerful set of tools to achieve compliance with organization rules, better data validation and integrity and ensuring you get paid properly for all relevant fees. Our software has a self-updating database of section codes for both USEF and Equestrian Canada. 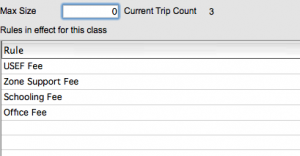 You’ll have instant access to correct section codes during class setup. You can instantly apply complex rules to one or more class, allowing you to ensure correct fees are charged or to meet other types of requirements. The show series feature lets you maintain entries numbers across a series of shows and even replicate entries or groups of entries through a series of shows. It’s powerful stuff. ShowGrounds is an evolving program that is only getting better and better. The ShowGrounds software is so user-friendly. Entering data is a breeze and I love how connected it is to USEF. NO travel and NO lines and SO convenient! ShowGrounds is a great solution for our busy office. Easy close-outs for big barns AND individuals! ShowGrounds is revolutionizing the way we run our shows! Constant communication with the programmer is key . . . if we by accident have any onsite issues, ShowGrounds will remotely solve it. With ShowGrounds, it’s fast and easy from show setup right through to entering results! Stabling off the showgrounds four miles away, it’s a real effort to have to go to the horse show office to do something. . . . ShowGroundsLive makes it so much easier! The tie-in with USEF is fantastic. We can check membership suspensions easily. It’s saving us tons of time in the office, and our competitors enjoy being able to check up on their entries, and all of their friends, online. I appreciate all aspects of the software from setup to closing down a show — very easy to use!